From the get-go, both April Bennett and Keren Marzinke knew something was wrong with their kids. The veteran mothers, with four children apiece, could tell early on that their newest additions weren’t looking at them, connecting with them or reaching out the way their older kids had. Peter Bennett, now 3, couldn’t focus his eyes and never smiled. Arthur Marzinke, now 2, began having seizures when he was just weeks old. The Bennett and the Marzinke families began their separate, but somewhat parallel, efforts to discover what was wrong with their babies. 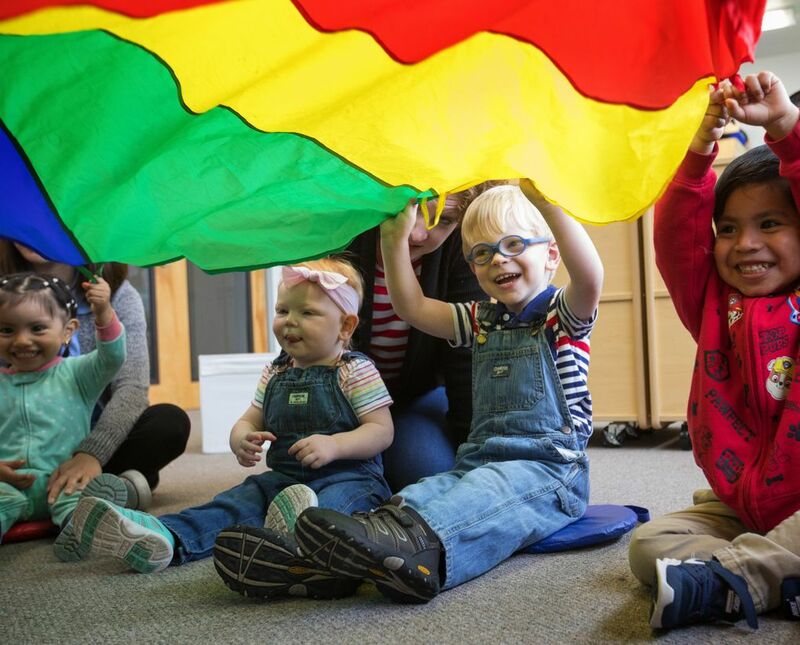 Their journeys started with doctors and hospitals and vision tests and MRIs and led to diagnoses, tears and commitments to provide the best possible outcomes for their little ones. Peter, it turned out, has a rare disorder called optic nerve hypoplasia in which the eyes’ nerve bundles fail to develop properly and for which there is no cure. Arthur was diagnosed with tuberous sclerosis complex, a disorder characterized by the growth of benign tumors throughout the body, and an uncertain prognosis. In Arthur’s case, the tumors affect his vision and cause seizures. 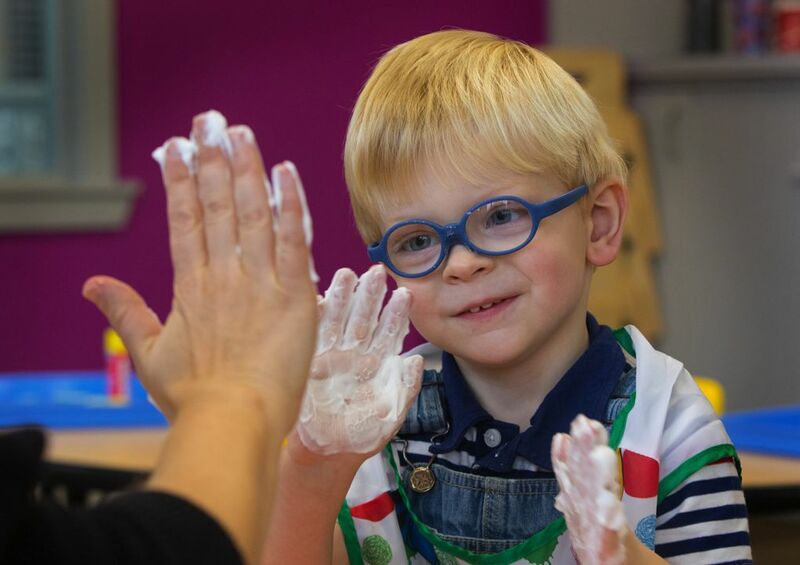 The families wound up at Kindering, where children are connected to an array of specialists and services — such as physical, occupational and speech therapy — and parents find new skills, moral support, encouragement and hope. One of a dozen nonprofits that share reader donations raised by The Seattle Times Fund For The Needy, Kindering was founded in 1962 by five families struggling to raise disabled children at a time when social services were scarce. What started as a swim club now has a mission to provide the best education and therapy to children of diverse abilities throughout King County. 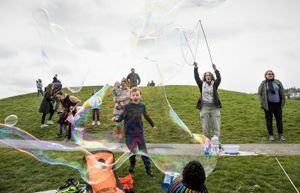 Thousands of families get help each year with developmental evaluations, preschool, early-learning intervention, classes for parents, sibling workshops and a host of other services at campuses in Bellevue, Bothell and Renton and at family homes, according to spokeswoman Alison Morton. So successful are its methods and philosophies that each year its services are estimated to save Eastside school districts about $14 million, according to Morton. Most children are referred to the agency by their pediatricians who know that early intervention and targeted therapy during the critical window from birth to age 3, when children’s brains are at their most flexible, can lay the foundation for a lifetime of learning and accomplishment. Kindering provides an array of services — such as physical, vocational and speech therapy — for children and offers support for their families. $50: Art supplies for a Sibshop workshop. Sibshops are lively peer support groups for school-age brothers and sisters of kids with special needs. Donations allow the agency to ensure that no child with special needs in King County is turned away because of family finances. Traveling specialists visit the Marzinke home five times a month to bring services to Arthur, the youngest child in a home-schooling family of six, that includes her husband and four children. 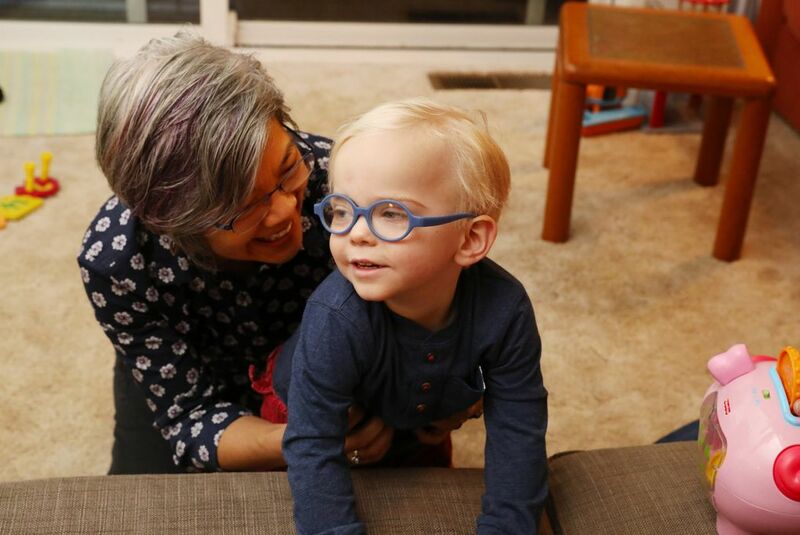 During a visit by Elda Harada, a physical therapist who comes to the Marzinke household weekly, Arthur was learning how to stand up, shift his weight and sit back down. Using a spinning pinwheel, Harada lured Arthur from one location to another in the family’s cozy living room while his parents and siblings cheered. “The goal is always to increase functionality and independence, and the trick is to find the motivation,” said Harada. “One of the things Kindering has done is help us uncover ways to engage a child who doesn’t engage normally,” said Jonathan Marzinke, a software developer and church leader. “It was new to me because I never had to motivate my other children to reach for a toy,” said Keren. A big moment for the family came when Arthur was able to smile and point to a mouse in one of his books. “That was when I knew he could learn, and that gave me hope,” said Keren. That’s something the Bennetts are also learning. 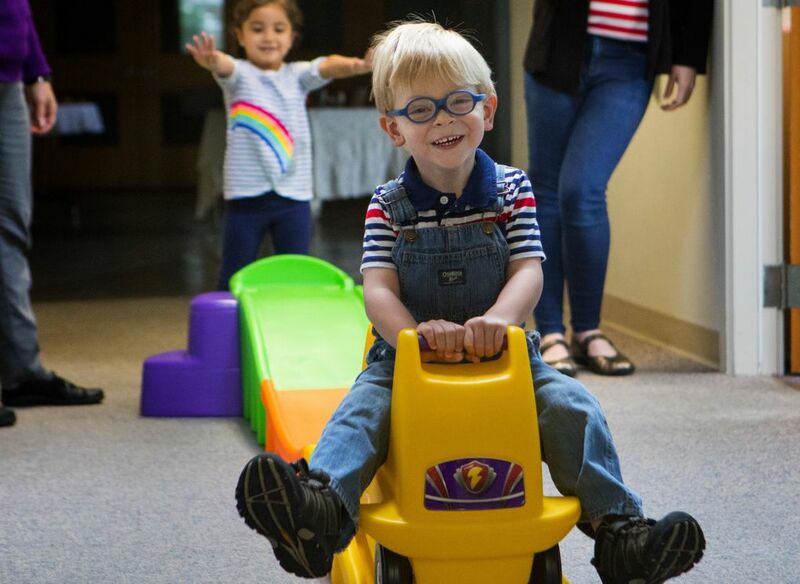 When Peter walks into the preschool at the Renton facility wearing his glasses and using his mobility cane, he’ll often make his way first to the airplanes and truck table. Left to his own, he could be happy in that spot all day, his mother said. But at Kindering, the kids are stretched to do things out of their comfort zone. So for Peter, on one recent morning, that meant moving from the airplanes to a table where classmates were finger painting with shaving cream on little mirrors. That gives him a chance to work on some fine motor skills and experience new sensations. When the children gather for snack time, their teachers and therapists might be working on skills such as holding a fork, making eye contact or sharing. 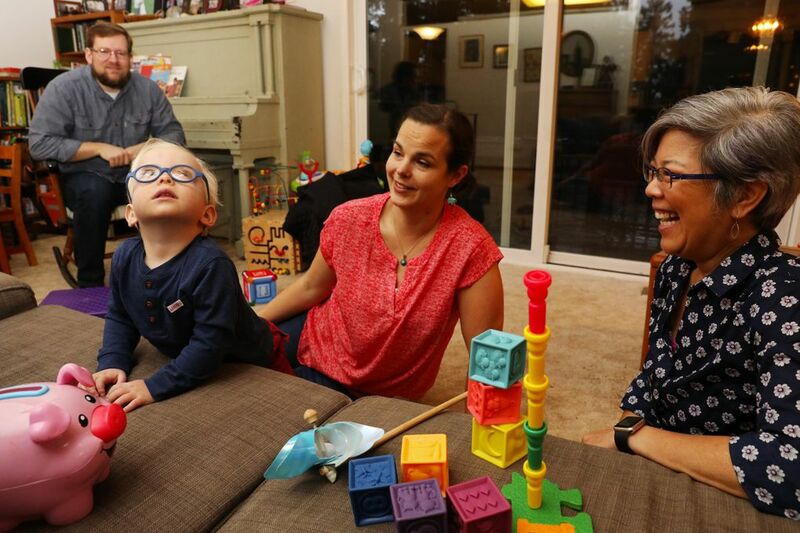 “The kiddos don’t know it, but everything they do here is therapy,” said April Bennett, of the Renton Highlands, who closed her business as a consultant in child development after Peter was born. Because one of Bennett’s older children has vision issues and wears corrective lenses, she originally thought Peter might have the same problem. When she got the diagnosis of optic nerve hypoplasia, she and her husband, Mark, a Boeing employee, were devastated. But with the help of Kindering, the Bennetts are now moving forward with a plan that includes Braille lessons for all of them.